After working for MNA for a few weeks, journalism interns Kerri Jo Molitor and Carolyn Sundquist decided they needed to get out of the office and explore a sanctuary firsthand. The sanctuary they chose, A Looking Glass Sanctuary, is in Clinton County and was donated to MNA by the Fellowship for Today church in East Lansing. The below video of the sanctuary was a joint effort by both Carolyn and Kerri. Michigan has many unique habitats and is home to many endangered and special species of plants. In fact, many of MNA’s sanctuaries protect endangered and rare species. The Michigan Natural Features Inventory (MNFI) Web site lists quite a lot of them. But what are the top endangered species in Michigan? Botanists from the MNFI helped MNA compile a list of the top eleven for your educational pleasure. The list is based primarily on global rank, so critically imperiled (G1) and imperiled (G2) ranked plants are included. For the globally rare category ( G3), Great Lakes endemics drove what was included in the list. 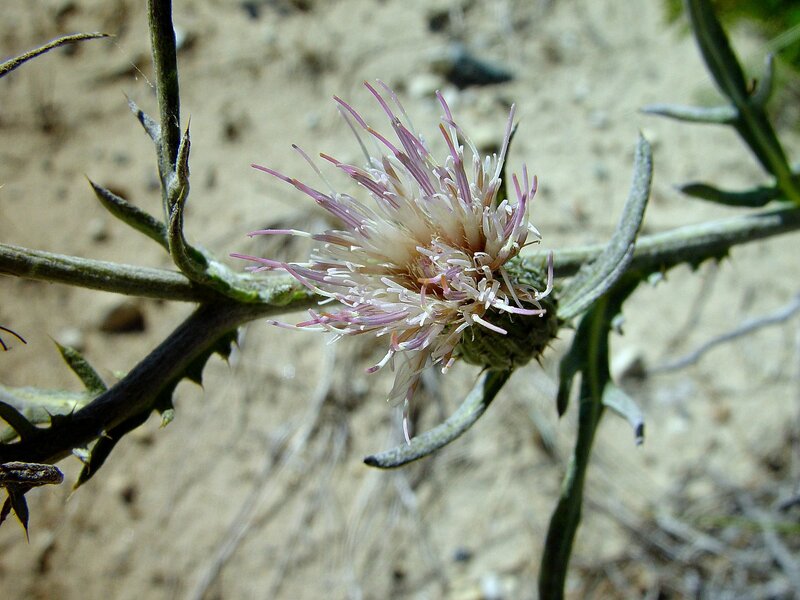 This is a perennial thistle with bluish-green leaves and few spines. It is densely covered by white-wooly hairs and has numerous pale flower heads. Found in open Great Lakes Dunes, it is endemic to Great Lakes shorelines. Of the Great Lakes region, Michigan has the best population of this plant. It has been observed in most of the Eastern Upper Peninsula and along the shoreline of Lake Michigan and northern Lake Huron. A small fern of about 10-15cm, the moonwort resides in grassy dunes along Lake Superior. It is only found on large perched dunes at Grand Sable within the Pictured Rocks National Lakeshore and was last observed in 1985.The leaf is nearly stalkless and is divided with up to six acute-tipped leaflets that don’t overlap. A perennial forb (any herb that is not grasslike), this plant is found in moist calcareous rocky soils. The typical habitat for this species is limestone pavement. This flower was last observed in Mackinac County in 2007, where the sole known population in Michigan resides on the upland edge of a fen complex along a roadside edge. 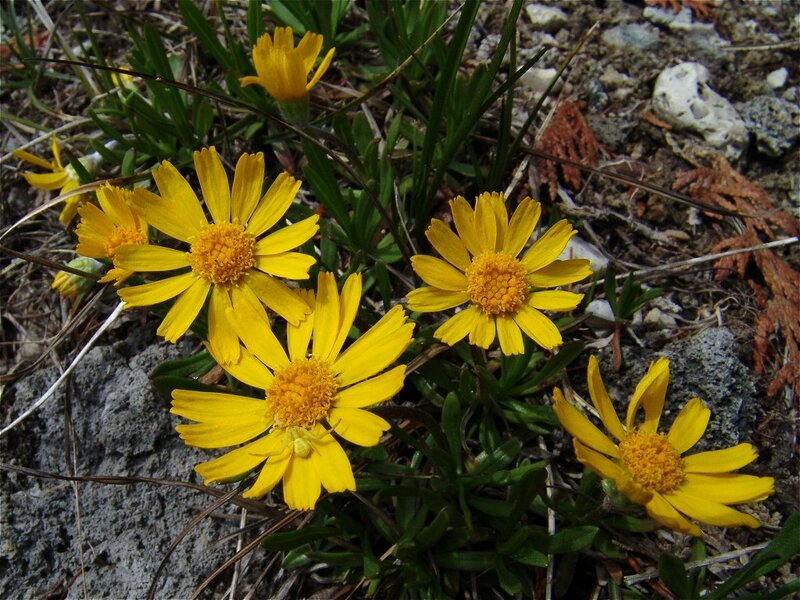 It has leaves that are narrow and dark green and flowers that are daisy-like and solitary borne on stout hairy stalks. 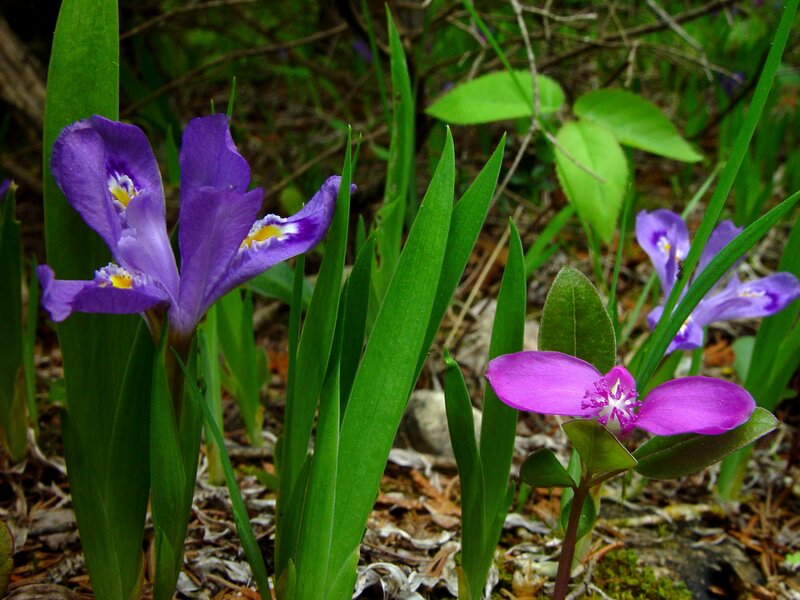 This iris-like flower is endemic to the Great Lakes shorelines and in Michigan has only been observed in the Straits area. In the Great Lakes region, Michigan has the best population of this plant. It is found in coastal cedar-fir-spruce forests and limestone pavement/grassland areas. It has short, flattened leaves with deep blue, iris-like flowers. A small orchid of about five to 20 centimeters, this plant lives in swampy woods and is known from a single locality in southwest Lower Michigan (Berrien County). It was last observed in 1989 despite thorough surveys by expert botanists. It is superficially similar to the cucumber root with five to six whorled leaves, but the stem is hairless, hollow and covered a bluish waxy or powdery bloom. It has a flower sessile with three short green sepals and a white lip. This clubmoss has creeping stems with occasional upright shoots with large thickened fertile strobili. There are spreading leaves with several marginal teeth on each side. It is found in mostly acidic sands, in seasonally flooded wetlands and potholes in glacial lakeplain landscapes. This plant was last observed in 2003 in Muskegon County. This plant also has creeping stems with occasional upright shots but bearing small, slender fertile strobili. The leaves fit closely together and have no marginal teeth. It’s also found in seasonally flooded wetlands in shallow depressions and potholes in glacial lakeplain landscapes. It was last observed in St. Clair County in 1999. 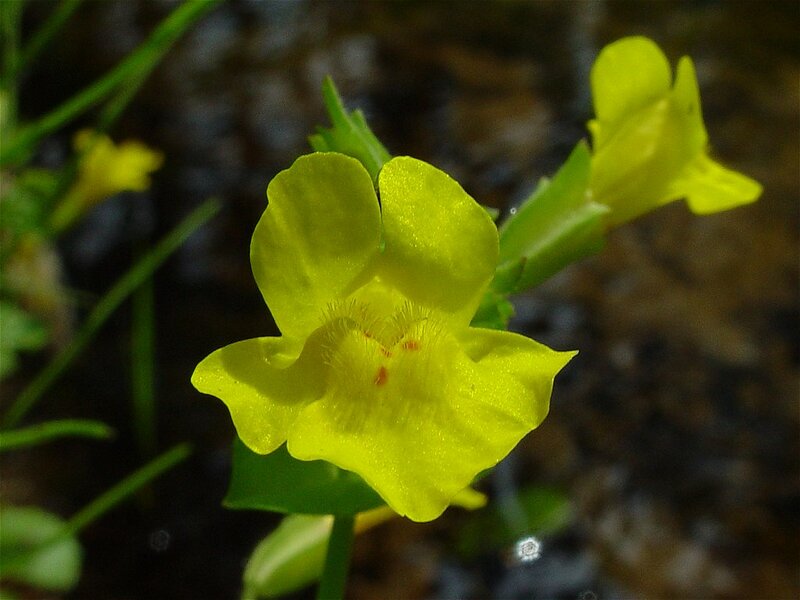 Michigan monkey flower (Mimulus michiganesis) Photo by Chuck Peirce. 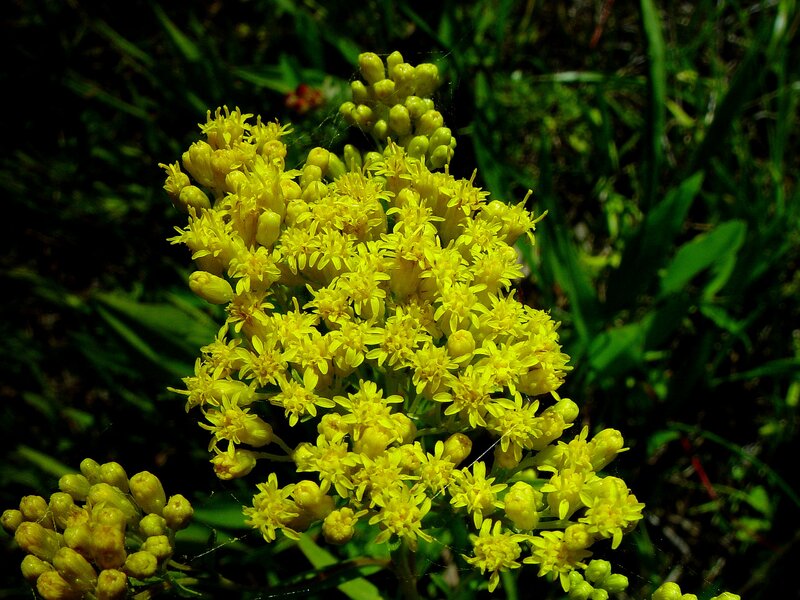 Found in the Grand Traverse and Mackinaw Straits area, this plant is entirely endemic to Michigan. It only grows in cold calcareous springs, seeps and streams through northern white-cedar as well as at the base of bluffs near the Great Lakes shoreline. It is a prostrate mat-forming forb with rounded and opposite leaves that have coarsely toothed margins. It has tubular flowers (15-25 centimeters) with yellow petals and a red-spotted lower lip. Botonists at the MNFI state the global rank of this plant species is outdated and needs to be updated to G1 (critically imperiled) in the future. 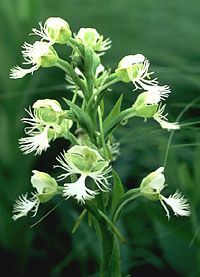 Prairie white-fringed orchid (Platanthera leucophaea) Photo by Chuck Peirce. This is a stout orchid with a leafy stem and larger, narrow leaves that taper at the base. The flowers are clustered on a terminal stalk, creamy-white and three-parted with a prominently fringed lower lip. This orchid is found in wet prairies and bogs with moist alkaline and lacustrine (lake) soils. It is rare, but this orchid can colonize highly disturbed sites like ditches, unmowed old fields and even the edges of golf courses as long as competition is not overly intense and proper soil fungi are present. It has been observed scattered throughout Southeastern Michigan and in one county in the Northern Michigan. It was last observed in 2009. This is a very small annual bulrush with small clumped stems and lateral, compact spikelets. The achenes (small, one-seeded fruit) are black, rounded and covered with wavy horizontal ridges. It is found in intermittent wetlands within oak barrens complexes and last observed in 1989 in Allegan County. This is a medium-sized forb with narrow and folded leaves that taper to a slightly clasping base. It has a flowering flat-top with large, showy yellow flower heads bearing elongated rays. Although endemic to the Great Lakes region, Michigan has the best population of this plant. It is found mostly within the Straits region, usually near the shoreline in linear interdunal areas and former embayments. It also can be found in alvar and bedrock beaches. It was last seen in 2007 in Chippewa County. This list is based primarily on global rank, and therein lies the reason he couldn’t cut it down to the top ten. He took the top several based on G rank (see chart below), and then it remained to be winnowed for the G3 ranks (globally rare category); Great Lakes endemics drove what he included, and because Michigan has the best populations of Houghton’s goldenrod, dwarf lake iris, and Pitcher’s thistle (all known only in the Great Lakes region), there was no way to choose among those. Michigan monkey-flower has an outdated global rank that should be changed to a G1 in the future. The Betty and Ralph Campbell Memorial Plant Preserve at Helmer Brook is tucked into the northwest corner of Battle Creek, Michigan. A quiet, hidden spot, this MNA nature sanctuary is one of five found within city limits. Quiet until the trains come. Eight Amtrak trains run through the 10-acre Battle Creek area preserve each day—four each way. Amtrak has owned the track since the mid-1970s, but it changed hands often before that. Consolidated Rail Corporation and Penn Central Transportation Company are two of several. More than 100 years ago, fill was piled perhaps 15 to 25 feet high through a wetland complex containing various plant communities including prairie fen. The fill was used to create a base for the railroad track, but convenient transportation came with the cost of cutting the wetland in two. 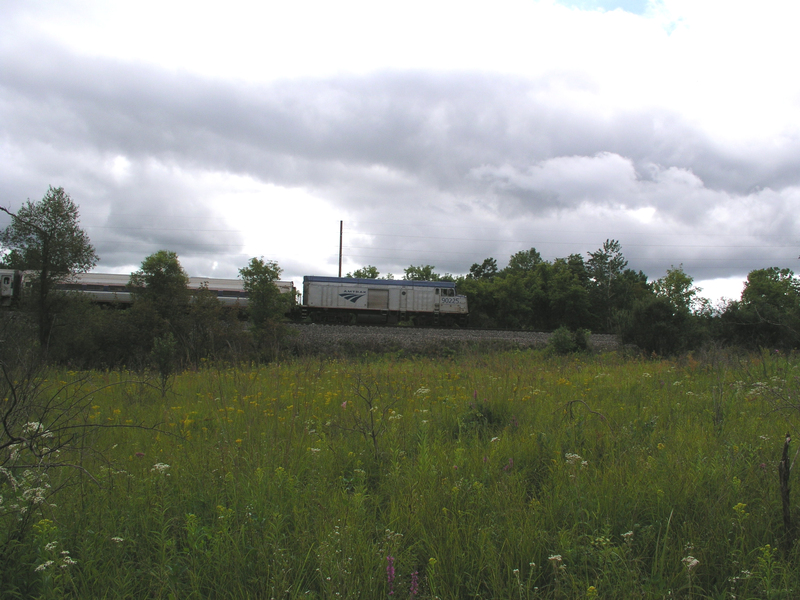 The area parallel to the tracks became upland, and in a unique twist of events, the railroad running on Helmer Brook’s south edge created two other natural plant communities—mesic prairie and oak barrens. Invasive plants were not as common at that time, allowing native plant species to make it a home. Today, such a disturbance would allow invasive plants to colonize and outcompete native plants. The habitat would be destroyed. 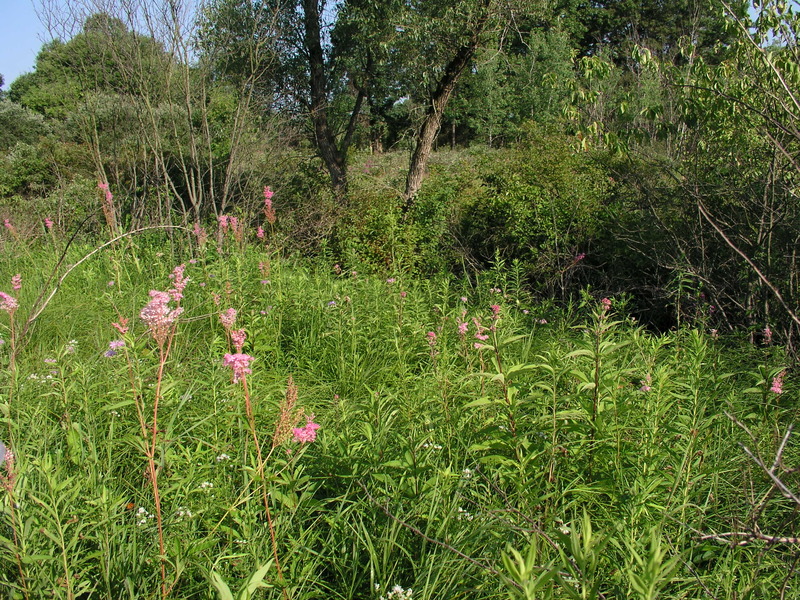 But without the competition of invasives, two plant communities were able to establish in Helmer Brook. According to the Michigan Natural Features Inventory, fires historically burning through areas of oak barrens and mesic prairie often spread into adjacent prairie fen habitats. This fiery progression may have begun with the help of the railroad in Helmer Brook, where the sparks of passing trains ignited the dry vegetation of the oak barrens and mesic prairie. The fire, in turn spread to the neighboring prairie fen. Fire suppression came into full force after 1940 following several Great Lakes forest fires. Instead of natural fires, those sparked by trains on the railroad tracks may have helped to maintain the prairie fen. According to the Michigan Natural Features Inventory and Schultz, fire can decrease the amount of shrubs, trees or other woody vegetation, allowing light through to areas these plant types would normally shade. Schultz said fire also recycles dead leaf matter that can build up on the soil surface. This allows the sun to penetrate and heat the soil faster, allowing a variety of seeds to germinate more quickly. Schultz said the prairie fen surrounding the railroad tracks is part of this larger system. Oak barrens or oak savanna often form the upland portions surrounding prairie fen. The fen is a wetland community made up mainly of sedges (grasslike plants), prairie grasses and many wildflowers. Uplands typically provide the groundwater springs that flow through a fen. With natural wildfire suppression a necessity near Battle Creek and the railroad, MNA has turned to controlled burns. “It’s essential for that area to burn to keep it in its highest functioning state,” Schultz said. 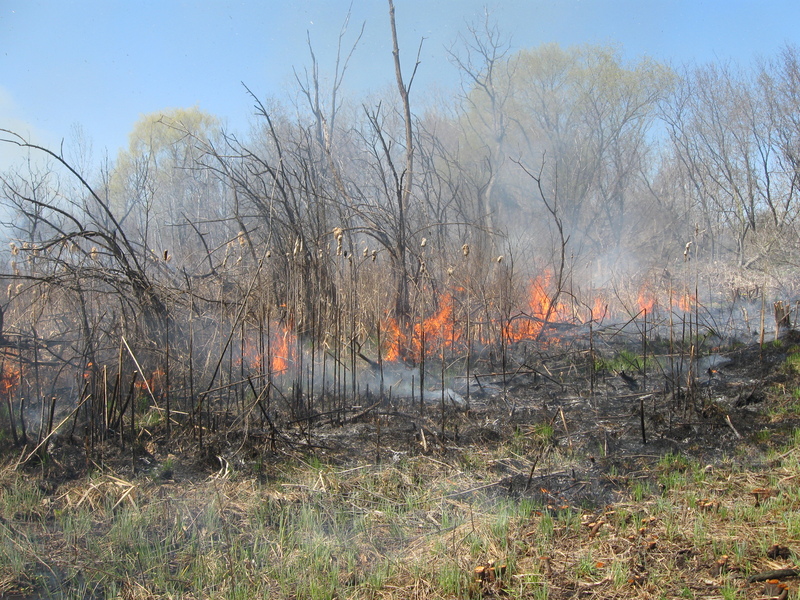 MNA performed controlled burns annually from 2006 to 2009. Burning also helps to control invasive species like glossy buckthorn, which can continue to sprout from the seed bank for seven to eight years after plant removal. Without fire, other invasive plants can invade. Invasion and a lack of maintenance from fire can slowly lead to biodiversity loss as invasive species push and shade out native species, Schultz said. But recent events have shown how controlled burns may help replace the possible railroad fires of the past. Schultz said certain types of orchids need plenty of light to germinate. He thinks the yellow lady slipper orchid recently seen at Helmer Brook may be such a case, as it has appeared in two recently burned areas of the preserve.